Due to be released on April 4, P Storm <P風暴> is the latest installment of the Hong Kong crime thriller franchise. The successful franchise began with 2014’s Z Storm <Z風暴>, followed suit by S Storm <S風暴> in 2016 and L Storm <L風暴> in 2018. 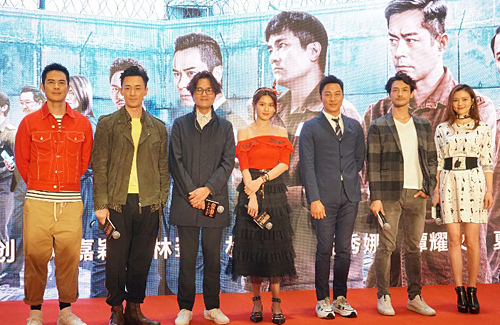 The latest installment sees the return of Louis Koo (古天樂), Kevin Cheng (鄭嘉穎), and Gordon Lam (林家棟), while also welcoming new cast member Raymond Lam (林峯). With the film premiering next week, the cast got together for a promotional function and drew in large crowds of supporters. Raymond, who will be starring as the film’s main villain, expressed, “I am witnessing the full capacity of the franchise. It is very strong and it’s jam packed here. I can definitely feel the fans’ anticipation for this film.” There were more than a thousand people at the promotional event. Gordon starred in the first installment, Z Storm, and is making his return to the franchise’s latest sequel. Eager fans teased whether he would have any kissing scenes in the movie. Kevin chimed in jokingly, “We can add a relationship arc for him in the next installment! So he can have the chance to date!” Known for putting his career and passion for acting before all else, Gordon has only ever been rumored to have dated Fung Bo Bo’s (馮寶寶) niece, Rosetti.